Being in her twenties, you'd think she would have grown out of that uniform by now. Though in a way, she has. Someone continues wearing an iconic costume, even if they logically should no longer be doing so. Maybe they were simply wearing it as a one-off initially, or it was justified at the time, but it continues to be worn well after the justification has worn off. Alternatively, a common version is a school uniform being worn after graduation. Usually the costume has become so iconic and associated with the character that changing it could lead to outcry from the fans, or even the author might be a fan. Compare Limited Wardrobe which is when characters are seen wearing the same clothes day after day. In Dragon Ball Z Gohan wears a helmet as part of his Saiyaman costume. When he enters the annual fighting tournament as Saiyaman, he replaces it with a cloth and sunglasses because armor isn't allowed. In the 13th movie when Gohan dresses as Saiyaman, he still isn't wearing his helmet. Averted as of Dragon Ball Super, where Gohan goes back to the helmet. Dragon Ball Z: Resurrection F gave Goku and Vegeta new costumes for their training under Whis. In Dragon Ball Super, they keep the costumes for the next story arc, but afterwards they revert to their iconic looks (Goku's unmarked dogi from the Buu Saga, Vegeta's battle armor from the Android Saga). Franco-Belgian comic character Spirou kept his hotel groom outfit for a very long time of the series, even if he had become a reporter and had no reasons to still wear it. Donald Duck still wears the sailor suit. He debuted as a young duck in the thirties (when this style was humorously outdated). Some comics do make him an actual sailor, though strangely enough not the Barks/Don Rosa canon. He even wore it in a 1941 short when he was Drafted into the Army. It was replaced with an army uniform, but still looks really bizarre. Ultimate Marvel: Daredevil and Elektra were introduced in Ultimate Daredevil & Elektra, where they are Not Wearing Tights but just street burglar clothes when doing vigilante stuff. But when they used in Ultimate Spider-Man, they are using the classic ones. In early-1980s Doctor Who everyone had consistent, unchanging costumes for reasons having to do with merchandising, some falling under this trope. Tegan wore her air hostess uniform for two series, though at least for most of that time she was actually trying to get the Doctor to return her to Heathrow so she could take up her duties (she did change outfits eventually, after being returned to Earth only to get the sack from her airline). The one that really doesn't make sense is Turlough, an alien who hated his exile on Earth at a boys' school, yet wore his slightly-too-small school uniform for his entire tenure on the program. In the The Hitchhiker's Guide to the Galaxy radio plays and the novels, television series, movie, comic books, and video games based on them, Arthur Dent is rushed out of his house one morning in his dressing gown (what Americans would call a bathrobe and slippers) and doesn't change out of them for years, despite (eventually) having ample opportunity to do so. AC/DC's Angus Young originally became a member of the band while he was still in high school, and so wore a school uniform — his real one — on stage. Decades later, and he still has his distinctive schoolboy look with full uniform. Sakura Kasugano, pictured above, takes it perhaps too literally. In the Sakura Ganbaru manga, she justified fighting in her school uniform as being ready to fight at any time. Thusly, being a student, she wanted to be ready to fight in clothes she spent much of her day wearing. 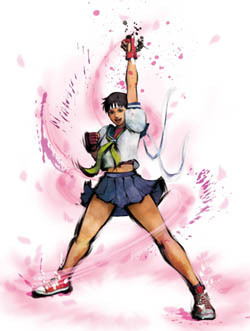 By Street Fighter IV, Sakura has since graduated, but as you can see still wears the uniform to fight (she even considers it her proper sparring attire). However, at the end of said manga she wears a different uniform — because she's a PE teacher now. And since it's an alternate costume for her in IV, this is evidently the case there as well, as seen by her ending in SSFIV. This is finally averted in Street Fighter V, where she has graduated from high school and works part-time at an arcade, though her new costume still superficially resembles her old sailor suit. According to an interview, when the Super update of Street Fighter IV was in development, the team behind it considered putting Cody back into his white shirt and blue jeans from the Final Fight series, but fans preferred his blue-and-white prison jumpsuit from Street Fighter Alpha 3. Thus, the "striped prison uniform and handcuffs" apparel became his default outfit for all of his appearances outside of the beat-em-up trilogy he debuted in, including the crossover games and the Street Fighter UDON comics. Like Sakura, Cody's costume changes in Street Fighter V into business attire with his hair slicked back because he's now the mayor of Metro City. In the opening of Chuck Rock, Chuck's Loincloth is in the wash, so he puts on some leaves instead. He's still wearing those leaves in the sequel, which takes place years later. In Raidou Kuzunoha VS The Soulless Army Raidou Kuzunoha is 17 and was, until his current apprenticeship/cover, a student, hence his school uniform. Raidou Kuzunoha vs. King Abaddon may or may not take place 3 years latter (A character that loves to break the fourth wall says you haven't met for 3 years and the games have a release gap of 3 years and the characters all act like noticeable time has passed), but Raidou still wears the uniform. While the fact that most of the characters in Persona 4: Arena wear school uniforms are odd for other reasons, The Hero Yu Narukami wears his school outfit from the first game, despite the fact that he has since transferred schools. BlazBlue: Jin Kisaragi continues wearing his NOL uniform throughout the series, even though he defected from that organization at the end of BlazBlue: Continuum Shift. Contrast with Noel Vermilion, who defected at the same time and switched to civilian clothes for the rest of the series. Deliberately averted in The Order of the Stick: Haley claims that, as the comic's leading lady, she's obligated to change her costume or look at least once per volume so they can sell more action figures. Of course, she has the most costume changes, but of the six in the order, only Belkar has had no significant costume changes since the beginning of the comic (barring art upgrades, of course).